Ceramic and porcelain tile ranges from the ultra-cheap tile that covers economy bathroom floors and tub surrounds, up to expensive finely crafted artisan tile meant more for listellos, banding, and decorative touches than for covering field sections. Between these two extremes lies an ever-shifting sweet spot in pricing that most homeowners aim for. Buying tile online affords homeowners the opportunity to pick, choose, and weigh their options at ease, without pressure from sales staff. But there are a few tricks you'll want to employ to score that cheap tile online. Porcelain sure sounds great. The word has a more authoritative ring than mere ceramic. Porcelain and ceramic are close, but not exactly the same product. To win the name "porcelain," the tile must have a water absorption rate of 0.5-percent as defined by ASTM C373. This impervious tile stands up well in moisture-prone environments such as bathrooms and can even be fully immersed. But do you really need porcelain for your application, especially given the fact that ceramic tile costs less than porcelain? On average, you will pay 60-percent more for porcelain than for ceramic. Also, keep in mind that only the most expensive 15-percent of porcelain and ceramic tiles are closest in price (with porcelain still slightly more expensive than ceramic). This means that when you get below that top-priced 15-percent, prices dramatically diverge. In other words, mid- and low-priced ceramic tiles are vastly cheaper than their porcelain counterparts. Unless you are installing bathroom tile or placing it in another high moisture environment, ceramic tile should work just fine for your application. Ceramic tile can even work in bathrooms as long as it does not receive prolonged contact with water. So, if you wish to use ceramic on bathroom walls (though not on tub or shower surrounds), you should be safe with this type of application. Subway tile, a classic item that graces many a bathroom wainscot or kitchen backsplash, is about as simple as tile gets. It is produced and installed by the millions annually. Rarely should subway tile be an expensive item. In one survey, white 3-inch by 6-inch subway tile at a well-known online home improvement retailer appears to be inexpensive, but skyrockets in price when shipping and handling are added. In fact, shipping and handling are well over 100-percent of the cost of the tile alone. Imagine a 100 square foot bathroom, whose tile price of $300 doubles to, and even exceeds, $600, after shipping and handling are added. That is a steep premium to pay for the benefit of having tile delivered directly to your front door. Do not be fooled by enticing online tile prices without bringing all other factors into the equation. Many consumers treat shipping and handling as an afterthought, but often shipping and handling are where the retailer profits. This isn't all about online tile retailers trying to fleece customers, though. A case of 12-inch by 12-inch porcelain tile covering a mere 14 1/2 square feet weighs a hefty 54 pounds. That's a significant weight to transport and deliver, and the cost will be borne by you, the consumer, not the tile supplier. If you are serious about saving money on your tile, make a simple spreadsheet, lay out retailers, tile price, shipping and handling, and extras. This provides you with a clear accounting of how much that online tile really costs, and which one is cheapest. Why would you buy tile at high prices from specialty houses rather than at discount stores? One good reason is that artisan tiles are cooler and more interesting. Popular artisan tile companies like Ann Sacks pay well-known designers to create gorgeous, unique, and inventive tile. Beauty and pedigree always come at a cost. But when you're dealing with basic field tile needed to populate a wall in large quantities, should you pay artisan prices for this? One solution to high tile costs is to use cheaper tile for those larger field areas and the more expensive tile for attention-getting spaces. If you desire, you can purchase the super-expensive artisan tile for borders, medallions, bullnoses, hand-painted tiles, and other special products that garner all of the attention. Online retailers Amazon and Zappos make returning items easy. It's not too hard to tape a printed label onto that shoe box and put it in front of the house for UPS to pick up. Returning tile is a different story. Even if the tile company will accept returns of unopened boxes within 30 days, are you prepared to ship and pay for 300 pounds of tile? Currently, there are few, if any, tile companies that will ship returns for free. The customer must bear the charges. But online tile retailers offer a solution: tile samples. 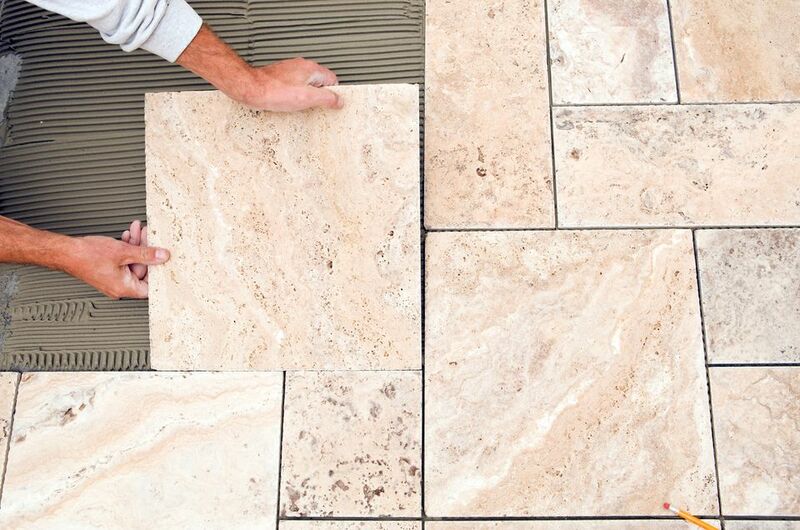 Many tile makers offer samples for purchase, and a few will offer truly free no-catch samples. Companies such as Fireclay and BuildDirect offer up to five free tile samples. This is not an act of generosity. Rather, it is a smart business move designed to entice customers to buy from them and to mitigate the possibility of those dreaded returns. Manmade flooring in years past was a pale imitation of ceramic tile. But technology has progressed to the point where vinyl, or resilient, tile looks amazingly like the product it seeks to copy. The first category of nearly perfect copies is called luxury vinyl tile. With improved graphics and deeper embossing, luxury vinyl tile may not have ceramic tile's rock hard consistency, but its flexible nature is easier underfoot. The second category is ​resilient tile that actually contains stone product. Armstrong Alterna is one example of this kind of tile that contains 25-percent manmade polymers and 75-percent limestone. Because the tile is lighter, shipping costs will be lower than with tile that contains all natural materials. A case of Alterna covering nearly 25 square feet is still, at 43 pounds, about 20-percent lighter than a case of ceramic tile that has less square footage coverage.